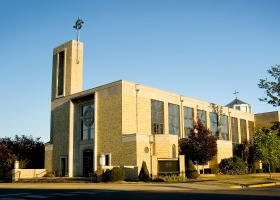 Welcome to our St. Paul Parish Website! Since 1844 the Catholic Community of St. Paul Parish has worshiped and followed the Gospel of Jesus Christ here in Highland, Illinois. From our humble beginnings, when Highland was a village of 60 families, we have become a parish family of over 4500 members and 1800 families. I have been privileged to be a part of Highland’s history for 57 years, having been born and raised in this community. I grew up on a dairy farm 6 miles north of Highland in rural route Pocahontas, near Grantfork, and as a member of St. Gertrude Church, Grantfork, received my sacraments of initiation there. My father attended St. Paul Grade School and my mother attended Immaculate Conception Grade School in Pierron. 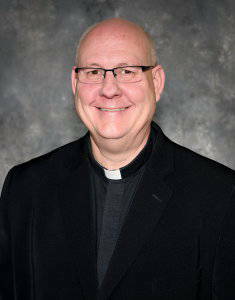 I never dreamed that I would return to become pastor and shepherd of the Catholic community in which I was raised. Being one of 10 children I know firsthand what family is all about. Since my arrival as pastor of St. Paul’s on July 1, 2015, devoted parishioners have demonstrated to me how closely knit this parish is as a family. This is exactly what I am accustomed to. Parishioners of St. Paul’s love Highland and are proud to be a part of the community and invite you to be a part of our community of faith. Please take some time to check out this website and always feel free to visit us anytime. Our doors are always open and our welcome is always extended to you to visit us and worship with us. Perhaps you have been here before, coming for our annual “Kirchenfest” in August, or maybe for a wedding, baptism, or even a funeral. Come see us and catch the Spirit which inflames our hearts daily to be faithful servants and authentic worshipers of Jesus. Please come and journey with us!